The Colt Top All Purpose is the definitive anti-downdraught cowl and perfectly designed to combat most issues that your chimney may experience. It’s optimum aerodynamic design harnesses wind flow perfectly to effectively combat downdraught, as well as to increase updraught from your stove or fireplace. Not only is it certain to cure downdraught issues but it also prevents bird entry and reduces rain ingress. You can be confident that the Colt Top will solve any downdraught issue as the product comes with a money back guarantee. That is to say that if the product has been installed correctly, and the downdraught issue still persists, you may return the product to the place of purchase within a reasonable time period and be given your money back. The Colt Top All Purpose is the only anti-downdraught cowl of its calibre which complies with the new BSEN 16475-7:2016 regulation and is also BSI kitemarkedTM so you can be absolutely certain of its quality and safety. 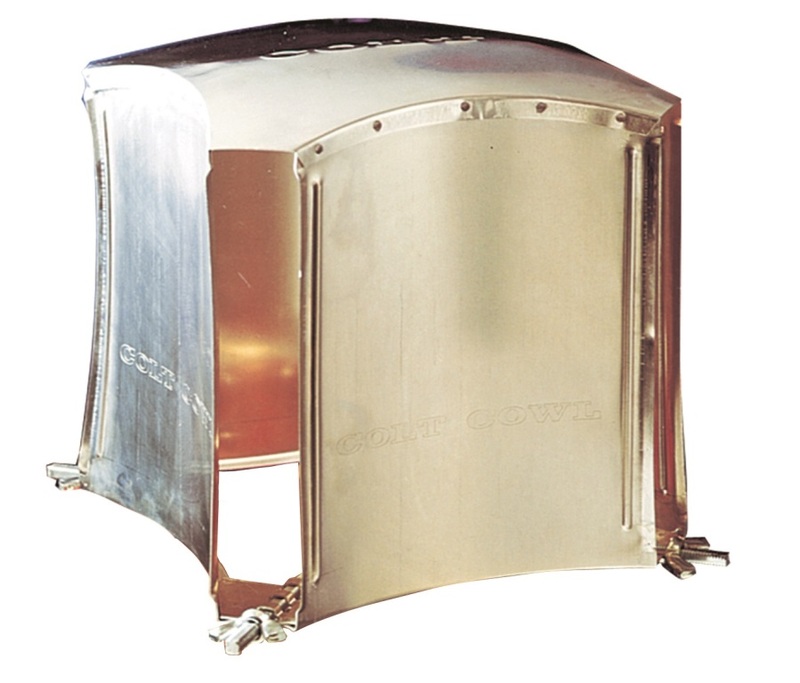 Colt Cowls are the only chimney cowl manufacturers with kitemarked products. The Colt Top was introduced to the market in 1985 and over a million units have been sold since. The idea behind the Colt Top was to improve on the design of the original Colt Cowl (see below). Previously, in order to achieve the best performance from a Colt Cowl the corner of the chimney cowl had to face the prevailing wind. The Colt Top is omnidirectional meaning that whichever way the wind blows the product will perform to maximum efficiency. With a mushroom-like lid, the cowl manipulates wind currents to draw on the flue, helping raise smoke out of your chimney. It is equipped with a gas certified mesh (which can be removed for use on solid fuel) to stop birds from entering the chimney pot, and comes with a rain gutter that traps precipitation through the banana-like holes on the surface, draining it out and away from the pot through the arched holes in its base (see image above). The Colt Top All Purpose is manufactured from high-quality aluminium, is powder coated in a terracotta colour to help make it resistant to corrosion, and is designed for use on chimney pots of 125 – 250mm internal diameter. The product comes with both strap and bolt fixings and in a robust display box. o As CTAP0001 but without a powder coating. Unsuitable for smokeless fuels. o As CTAP0001 but without the birdguard mesh, strap fixing kit, and the display box packaging. Unsuitable for gas fires. The Colt Top range is extremely effective at combating any downdraught issue. It is now wonder why that after 30 years the Colt Top still dominates the market. If you’re after the best of the best, this cowl is unbeatable.